Red-breasted Merganser is now, and always has been, the saw-bill of the tidal waters. Coward (1910) knew it as ‘a not uncommon winter visitor to the estuaries; rare inland’. Bell (1962) summarised its status as ‘today a regular winter visitor to the coast and estuaries from October to April’. Inland, Bell could trace only seven records in winter, 1893 to 1966, mostly singles but up to four birds for 18 days in 1942. This Atlas map typifies its present status, with birds in winter in 18 coastal and estuarine tetrads, and two inland, at the Weaver Bend (SJ57E) on 23 and 29 January 2005 and at Hurleston Reservoir (SJ67H) on 7 January 2006, making Hurleston the only site to have recorded both Red-breasted Merganser and Goosander during this winter Atlas period. The largest flock in one tetrad was 28 birds roosting at Parkgate (SJ27U) on a Dee WeBS count in 2004/ 05, with 25 birds off Heswall (SJ28K) in 2006/ 07 and 22 on West Kirby Marine Lake (SJ28C/ D) in 2004/ 05. These figures are typical of the wintering counts in recent years, although more birds are present at passage times, especially in March and April. Nowhere in the county approaches the criterion for national importance (1% of the population) of 98 birds. The Dee probably was more important for them in the 1960s, when it was realised that their main feeding area was the mid-channel of the estuary off Caldy. This is too far away from land for accurate observation, but unprecedentedly high counts were made of c.90 in late February 1965, rising to a maximum of c.250 on 5 March 1965, eclipsing the previous record of only 26 (Bell 1967). 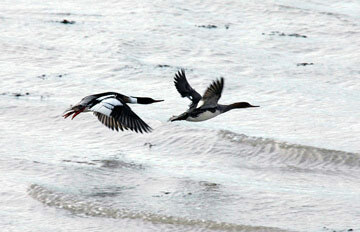 Since then, Red-breasted Mergansers have become much more numerous nationally, but not in Cheshire and Wirral. The WeBS index for birds wintering in Great Britain rose steadily, almost quadrupling between the mid-1960s and the mid-1990s, but has since dropped, perhaps as warmer winters reduce the numbers of continental immigrants. Red-breasted Mergansers swim part-submerged, then dive for their prey, often hunting cooperatively in small flocks. Their serrated bill is well adapted for gripping fish, and they take especially sticklebacks and gobies, with other small marine prey including flatfish, shrimps and lugworms. Most of the habitat codes recorded in this Atlas were H3 – estuarine (11 tetrads), with five H5 – open sea. The origins of our wintering Red-breasted Mergansers are not known, but British-breeding mergansers probably stay here for the winter, mixing with birds from continental Europe and Iceland, with some possibly from east Greenland (Migration Atlas). A few breed in north Wales, as close as 25 km to Cheshire, but they are never known to have bred in the county. A bird was reported to have built a nest at Oakmere in 1962, but no eggs were laid.